Bunny Milk Carton Treat Box! My "Pink" Projects & a HUGE Announcement!!! HAPPY HAPPY ST. PATTY'S DAY! Happy Happy Birthday Card ~ Gypsy Video!! SURPRISE!!! My VERY 1st VIDEO!!! ***The inside of my card says "You're in my thoughts Today!" I was talking low in my video because I didn't want to wake my boys up! lol... Next video I will do it @ my normal time so I can use my regular "Indoor" voice!!! Thank you for visiting my blog & don't forget to check out the rest of the Design team to see their Beautiful creations! Have a GREAT Day everybody! Emma this is just too adorable. I got my gypsy 3 weeks ago but it's sick so have to wait for Provo Craft to fix it. Thank you so much for your great videos. Hi Emma another cute card and great video,thanks. Another great card! I wish I could make my bows like that. You make it look effortless. I love the card! It's so adorable! Thank you for sharing. This is wonderful! So many layers that line up beautifully. Thank you for taking the time to help us! Gorgeous project Emma! I just love the gray shading of the marker and will have to give you credit on this tip when I start using it. I learn so much from you. As always, another darling card!! So cute and I love purple! OMGosh! You've got mad Gypsy skillz ;o) Such a SUPER CUTE CARD!!! And if if weren't for your video I wouldn't have known that it was a window card...LOVE IT!!!! Emma, you and that Gypsy absolutely amaze me! I LOVE your video tutorials! This card is so beautiful! 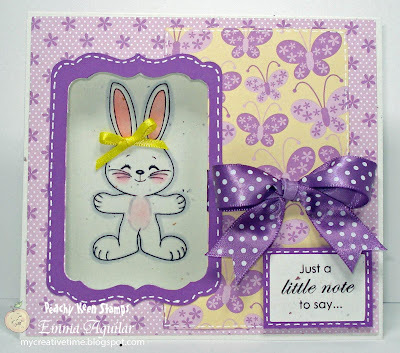 The complimentary lavender and yellow color combo, that pretty polka dotted bow, and the adorable bunny stamp just make this amazing window card a feast for the crafter's eyes! You are a wonderful inspiration!!! Thank you so much!! I am in the presence of greatness!! your amazing talent with the Gypsy is awesome Emma. LOVE your card, LOVE your videos, Love you! Another great crd Emma! TFS! That card is absolutely ADORABLE Emma!!!! Thanks for going to all the trouble to refilm it. Thank you for showing how you did this using the Gypsy. I love mine. Your bunny card is adorable. Mrs, Emma another beautiful card You know your stickes look like you used a sewing machine Love your card thanks for making again. I was needing my Emma Fix now I can relax. This is soooo cute!! LOVE the purple! This is SO CUTE!!! I love it! You are so talented, and creative!!! Keep up the great cars! I look forward to seeing more of your work! I am loving your videos and this little card is so stinkin' cute! I love the colors! Hi EMMAAAA !!! What a great card and, what talent you have at teaching! You made the welding/window card technique look as simple as 1-2-3 !!! OMG Emma what wonderful creations since I have been absent from blog hopping its lovely to be back. Emma this card is adorable! I love the bunny stamp and the colors are so pretty! Emma, I love your card! The purple with the cream is such a beautiful combo! The little bunny is adorable. I hope your feeling better, strep stinks! !